Some of my most cherished memories are the ones I spent with my cousins in my Mamama (maternal granny's) place. Long before the age of Nickelodeons and Nintendos, our summer vacations would mainly comprise of playing in the frontyard, amidst the trees, despite the scorching heat. Hide-and-seek used to be one of our favourites where we would hurriedly count upto 20 and rush to find the others crouching under the bed or stooping behind a tree. We would revel playing "family" and being pretend mommies and daddies working hard at the pretend office or sprawling our kitchen-set in the pretend kitchen. During one such evening, the daddies brought home some pretend fish (leaves of a tree) and we made some yummy pretend fish fry for them. I don't think my cousins would even remember this day - we were like 8 or 9 years old then, but I couldn't help smiling when I was shallow frying this fish, so badly wanting to relive all those pleasant memories. I followed my mom's recipe for this one, making a couple of minor changes. 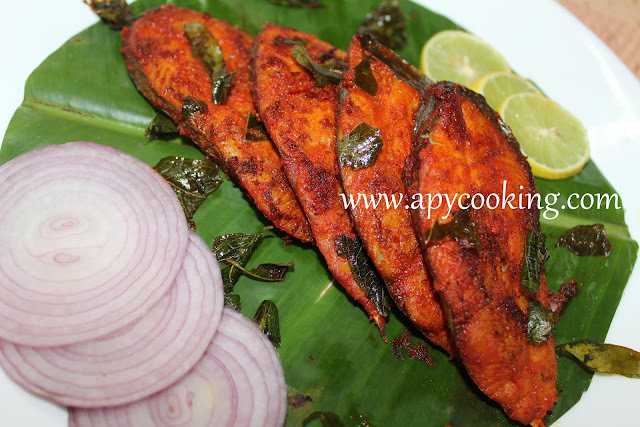 The chilli powder I used was a local brand which gave a wonderful colour and was less spicy. Adjust the spice according to your taste. If the fish turns out too spicy, drizzle more lemon juice before serving. Also, if vinegar is not available, replace with lemon juice. I used 7 medium pieces of anjal (surmai / seer fish). 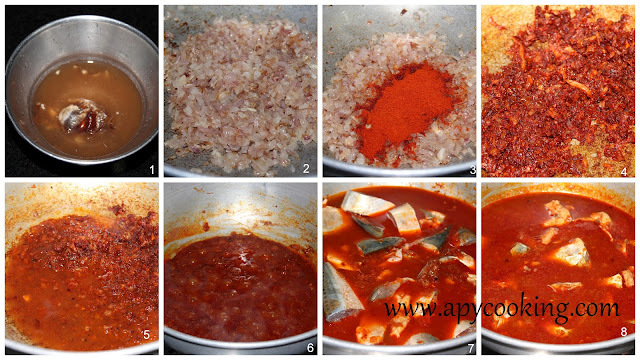 Grind all the ingredients under "for the marinade" into a smooth paste. [The marinade should be spicy and slightly salty]. Apply it all over the fish and refrigerate for a few hours [I kept it overnight]. Heat oil in a pan. Add lots of curry leaves, roughly torn. Place fish pieces and drizzle some more oil on top. Cover and shallow fry for a few minutes on each side, till the fish is completely cooked. Serve hot with a dash of lemon. 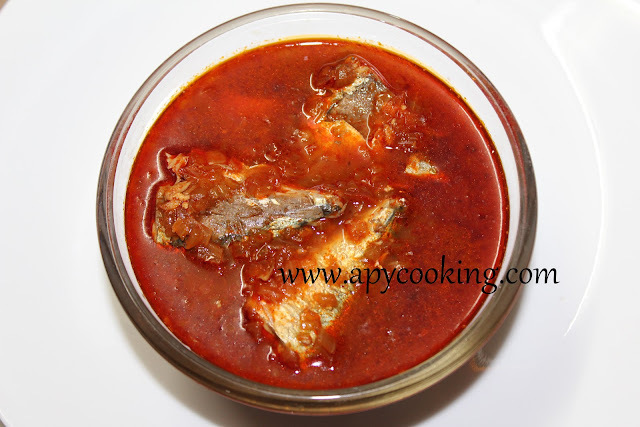 Raja Phanna Upkari is a super-spicy, delightfully tangy Konkani dish made with very few ingredients. "Raja" here refers to mackerel and somehow for me, this fish is irreplaceable. 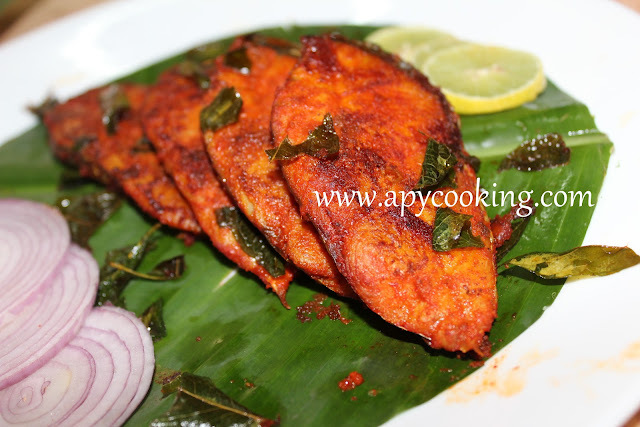 Ofcourse, you can make this dish with prawns or tilapia or any other type of fish, but I always found mackerels winning hands down on this one. In a small bowl, add 1/4 cup hot water and soak tamarind in it. In a deep-bottomed pan, heat oil. Add chopped onion and roast for about 10 minutes till they become brownish. Add chilli powder and roast on medium-low heat for 7 to 8 minutes. Squeeze tamarind in the water as much as possible. Add the water into the pan. Pour some more water on the tamarind, squeeze out the juice completely and add the water to the pan. Discard the tamarind. Add a cup or two of water and bring to a boil. Add mackerels. Add more water if needed and salt to taste. Bring to a boil. 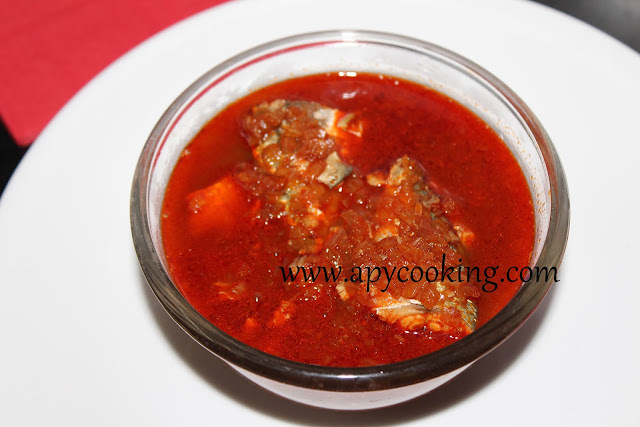 Simmer and cook till the fish is completely cooked, about 5 to 10 minutes. 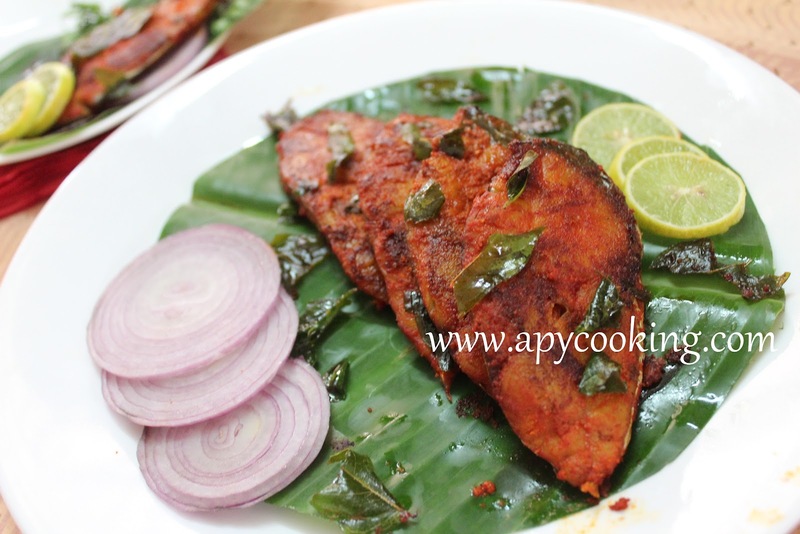 People also make this dish by grinding roasted chillies with tamarind. At my mom's place it's usually made with chilli powder. Either ways, the kick the chillies lend are a great accompaniment to rice along with milder fish curries. Love the combo! Fish fry anyone? Eating crabs can be a messy affair. That's why it's best eaten at home, when nobody is watching! Seriously, I get so involved with this dish that I have to be reminded that there is nothing more left that is edible. Alle Piyava Ghashi is a konkani delicacy where the crab is cooked along with chopped onion and ginger and you get a delicious aftertaste of these ingredients. 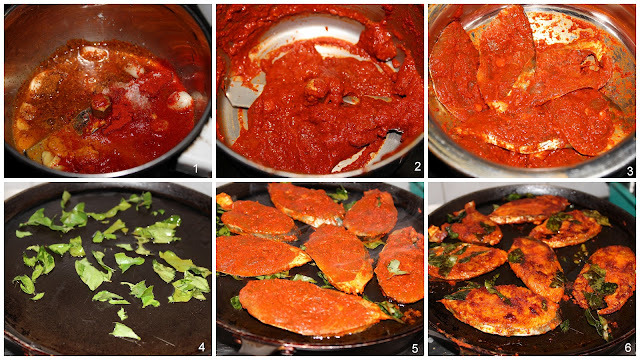 This is how crab is usually prepared at Amma's place. 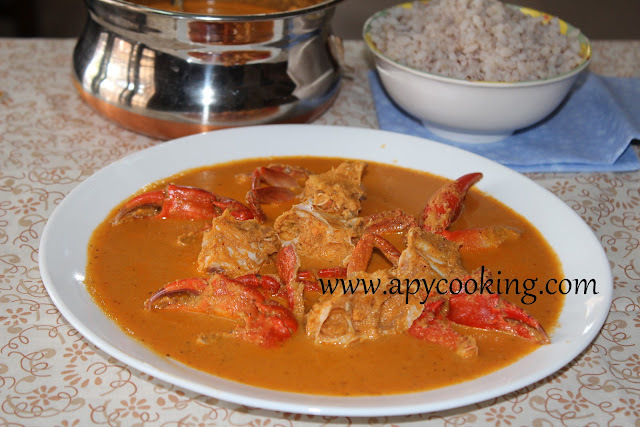 My mom cleaned and cut the crab for me and made most of this dish while I happily clicked pictures. 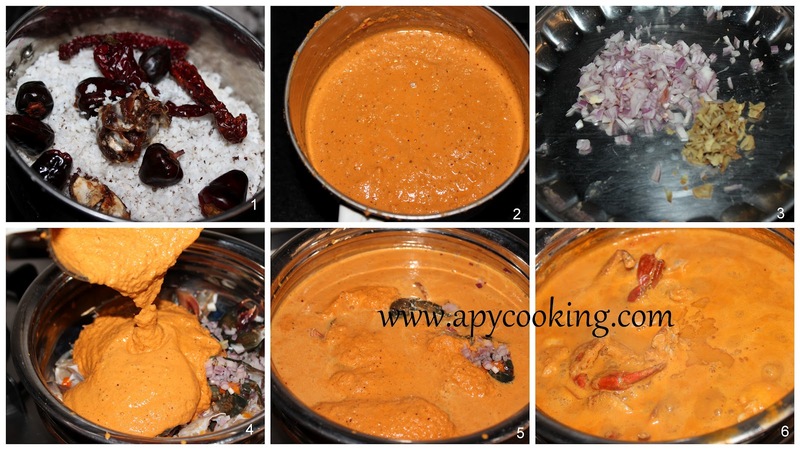 Grind coconut, red chillies and tamarind with enough water to get a smooth paste. 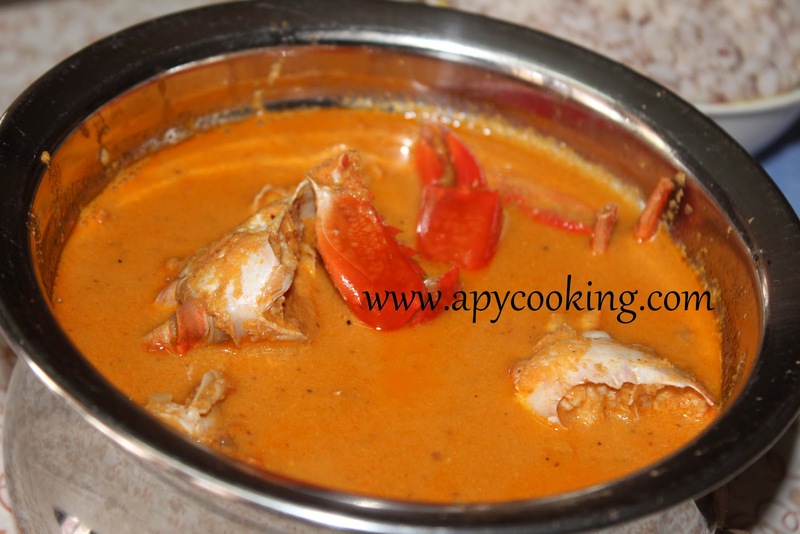 In a large deep-bottomed pan, add cleaned and cut crabs, onion, ginger and the ground paste. Add 2 cups water and bring to a boil. Add more water if needed. Cook till the crabs are completely cooked - about 10 minutes. Adjust salt, drizzle oil. Cover and keep aside for sometime. Like all seafood curries, this tastes better after a few hours or next day. I like it best with boiled rice, fried fish and a phanna upkari. Now what is that? More in the next post :). It's hot here in M'lore but somehow the weather doesn't seem to bother me. Probably because I have a lot of others things occupying my mind. Like missing Sunnyvale for instance. I love India, but a place that contributed to my growth immensely, cannot be forgotten easily. Glimpses of my kitchen come flashing into my mind, be it my oven, my cooking range, or for that matter my kitchen sink!! Right now I'm eagerly awaiting the shipment which will bring along with it a lot of my kitchen stuff that were so much a part of my life there. Coming back to Mangalore, I'm at my Amma's place right now. 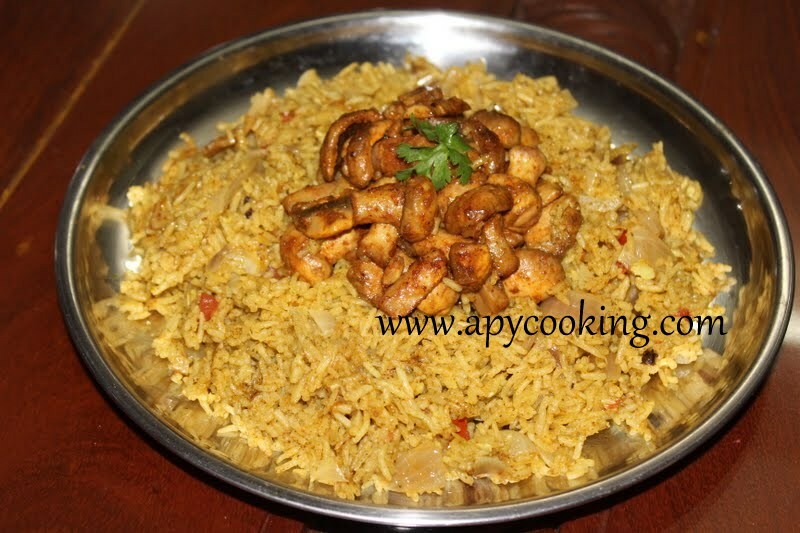 My brother visited last weekend and I made Mushroom Biryani for him. For the rice part I followed my egg biryani recipe. For step-by-step pictures go here. Instead of eggs, ofcourse, I used mushrooms. I must have used about 400g mushrooms. 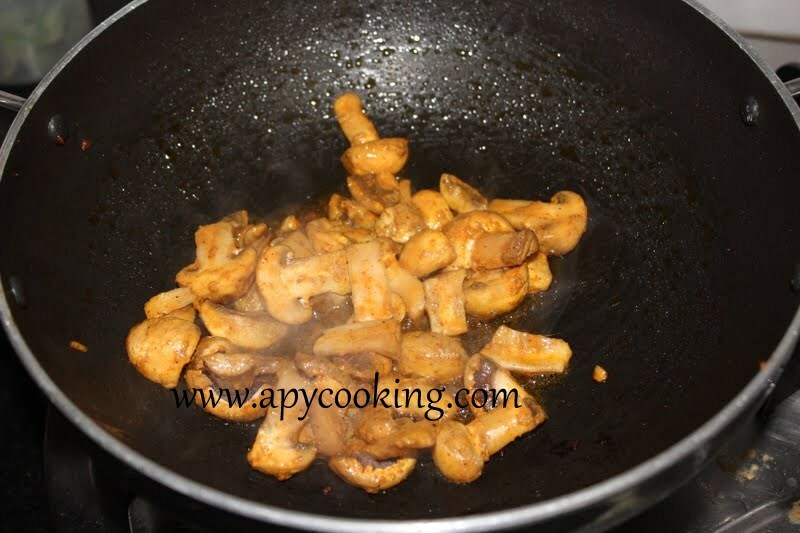 Chop mushrooms into quarters, wash and place them in a colander to drain off all the excess water. Mushrooms release a lot of water when being cooked so it's better to wash them well in advance and give enough time for the water to drain off. Transfer mushrooms into a large vessel. Sprinkle garam masala, chilli powder, turmeric powder, ginger-garlic paste and salt [I just eye-balled the measurements]. I also added 1 tbsp thick curd. Mix well and marinate for 15 minutes. Roast the mushrooms on both sides. Since mushrooms release water, it is better to roast them in 3 or 4 batches, a few mushrooms at a time. If you see them releasing water, increase the flame and roast uncovered for a few minutes (keep stirring) till all the water is absorbed. 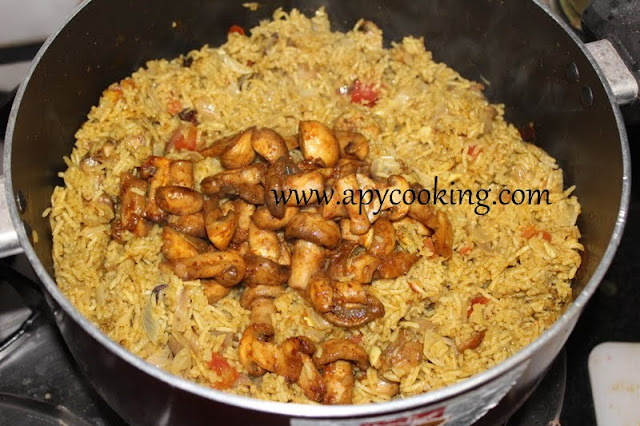 Once the rice is cooked, add the roasted mushrooms and mix gently. Or just spread rice on a plate and top it with roasted mushrooms. The next couple of dishes that will feature here are among my favourite. Keep guessing!